Waheguru Ji Ka Khalsa Waheguru Ji Ki Fateh. Hukamnama today is by Guru Ram Daas Ji, in Dhanaasaree Raag on Ang 668 of Sri Guru Granth Sahib Ji. Satguru Ram Daas Ji Maharaj, is blessing us today with this Hukamanama. Satgur Paadshah Ji Maharaj, their uncle’s son Bhai Sahaari Ji came and asked Satguru Ji this question. Thebayrhee - the boat which you are gonna cross over this ocean is jap - repeating over and over again with your tongue, Hari Hari Waheguru Waheguru again and again, repeating the Lord’s name, Waheguru Ji’s name with love and devotion. har tulhaa - the raft to sit on is that of Simran. 3:37 har har jap - listening to the Banee, the Gurbani is the boat. And the raft to sit on that is the Simran of Waheguru. har japi-o tarai taraakee; har japi-o by meditating upon Waheguru Ji, tarai taraakee - you are carried over. tarai taraakee - this means literally is to cross over this ocean. And tarai taraakee - also means quickly, in an instant you are liberated, you cross over the world ocean. har jee - O my Waheguru, laaj rakhahu har jan kee; rakhahu - preserve the laaj - the honor; har jan kee - of your humble servant. Waheguru Ji please protect my honor. har har japan japaavhu apnaa; har har - O my Waheguru Ji, japaavhu - make me meditate; japan - you’re your beautiful Naam, upon your - apnaa Banee. ham maagee bhagat ikaakee; maagee - I beg for, ikaakee only one thing, yourbhagtee - your devotion, your love. ikaakee also means in complete peace, I only ask for one thing. rahaa-o Guru Ji says pause and think about this. har kay sayvak say har pi-aaray Waheguru Ji’s sayvak - servants are pi-aaray - are beloved to Waheguru. jin japi-o har bachnaakee; jin japi-o who have meditated on Guru’s bachnaakee - on Guru’s words, on the Guru’s Banee. laykhaa chitar gupat jo likhi-aa - Those Gurmukh piaaray, the laykhaa - those accounts which have been likhi-aa - written down by chitar Gupt – a true divine beings that are writing down all the actions day and night. They write down day and night all the actions we do, all the thoughts we think, for our account will be presented in front of Dharam Raja. And Satgur Ji says in the court of righteousness, thatlaykha - that account that have been written sabh chhootee – all have been forgotten, taken away, destroyed. jam kee baakee; baakee - whatever is left over, of thejam - the angels of death messengers. Anything to do with them is all erased, if we meditate upon Guru’s Banee. Because Satguru Ji Sahib tells us in Gurbanee that the Guru’s Shabad is like a philosopher’s turn which turns any metal into gold. The Guru Shabad is amazing. Guru Nanak Dev Ji says in Raag MaaJh on Ang 143 of Sri Guru Granth Sahib Ji; satgur Khot-o-ay kharay karay sab savaran haar - The true Guru converts counterfeit to genuine through the Shabad. It is the Shabad that can turn even the counterfeit into genuine, can even turn metal into gold. So that is what Guru Ram Daas Ji Maharaj saying as well. It is the Shabad that can completely change all these things and can erase the accounts of the jamdoot and angels of death. har kay sant - O saints of the Lord,japi-o man har har - they meditatejapi-o; man - in their mind; with their mind and soul, they meditate har har - Waheguru Ji.lag sangat - because they are attached to the Sangat, by the company of who - saaDh janaa keeby the humble -jan; saaDh - people who are trying to control their minds, they are Gurmukh Piaaray, meditating; attach themself to their company. tum vad purakh O Waheguru Ji you are the greatest-vad; purakh - being; you are agam - beyond any approach; you areagochar - you are beyond the capacity of our mind to understand; tum aapay aap you yourself have created yourself. aap Apaakee - You are saibung you are self illuminated. There is no mother, there is no father, and you are self illuminating being. 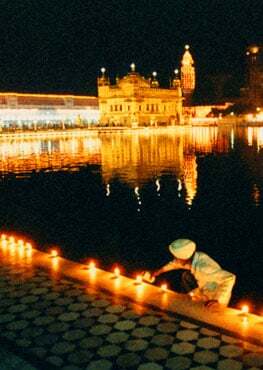 O my parabh - O my Waheguru,keejai bless me with your kirpa - your grace on the servant Nanak. kar daasan daas dasaakee Make me the slave of your slaves. And may that be our Ardaas throughout today with the grace of Satguru Guru Ram Daas Ji Maharaj.